Over the course of my nursing career, I’ve met some truly incredible human beings. Like, people with whom you’d love to sit down and have a cold beer, or sit at their kitchen table over a meal. Those kinds of people—the ones who make your soul smile and warmth spring out of even the worst of situations. Oftentimes I find myself in awe of the interactions I’m afforded with people, even on days when my feet are dragging and I would love a day off from work. Because I know that, had it not been for this awful situation that landed them in my infusion chair—a new diagnosis, a relapse, one more trial before purely palliative care— it’s ultimately the human connection that invigorates my daily practice, and that’s something I hope never changes. This past week, two of these such patients of mine visited me while I was working. The front desk rang on two separate days, informing me that a previous patient wanted to say hello. For anyone impacted by cancer and its treatment, you can understand my gut reaction of excitement, before quickly realizing that, on the other side of that door, could be unfortunate news coming from these patients’ mouths. But, as is the nature of nursing, I tucked away those fears and let myself be present in the moment, of being with my patient wholly. We will call my first visitor on Tuesday, “Adam.” I took care of Adam on my very last day as an inpatient nurse, and had become quite close with him and his wife. I will forever remember Adam for two things—one, his eye patch he would wear (due to transient diplopia, not because he was a pirate) pridefully as strutted the halls with headphones in. And two, because he and his wife were the only patients I told when I was leaving for a new job. Toward the end of my shift, Adam said, “Back in tomorrow, Ris?” I couldn’t lie. I turned and softly said, “No, actually. This is my last day working on the floor.” After explaining that I was switching to an outpatient infusion center in NJ, I realized how final my decision was. Was I doing the right thing? Adam and his wife could’ve just said, “best of luck,” and moved on with their lives. But instead, they hugged me with glistening smiles and congratulated me. They asked me all about my hours, my commute, my plans. I didn’t know it at the time, but I needed that final bit of excitement and encouragement heading into my new job. Adam did that for me. He also promised that, since he lived near the infusion center, he would stop by to visit if he could. He’s visited a couple times in the year since I’ve started. On Tuesday, he was in for a scan. He and his wife were understandably nervous, but trying to focus on their retirement and keeping busy together. Their spirit, their love for one another, and their kindness to think of me on what I’m sure was a long and anxiety-ridden day pierced through me. Adam was why I became a nurse. On Thursday, “Walt” paid me a visit. Walt is the kind of debonair and smooth older gent, whose devious smile and quick wit, unmatched only by his genuine eyes, will make anyone feel at ease the moment he speaks. I first encountered Walt while on orientation. He was new to treatment as well, so I like to think we were drafted together for an all star team of mischief mixed in with a bit of chemotherapy. In true Walt fashion, he asked all about me and if I was staying out of trouble. I then asked how he was doing, having instinctively known something was amiss. After months of having completed treatment, it had metastasized to his spine. Walt will be okay. His personality, realistic attitude, support system—they will make him okay. Although it was hard to hear this news, I would never let Walt see me sad for him. Because I’m not. Despite what happens, Walt lives life his way. He will always find humor, and passion, and kindness. Cancer will not change who Walt is on the levels that matter most. Adam and Walt connect two very important times in my life—inpatient nursing and outpatient nursing. Having met and known them, I am a better person. Out of the darkness that can oftentimes be cancer, they project this light that will never cease to shine. Few have this gift, but I’m quickly learning that, even in the most trying of times, during the middle of chemotherapy and radiation, souls can transcend the physicality of it and truly touch others. It is with their impact and invigoration in my own life, that I can try to share that gift with every single patient I meet. I know I won’t have the connection I have with Walt and Adam with many patients, but that will never change my practice. We all have something to learn from each other, or to pass onto each other. Walt and Adam’s kindness and spirit will touch every single patient I encounter. One day I will know how to tell them how much I appreciate them… perhaps over a beer. Marisa worked at the Hospital of the University of Pennsylvania on a medical-oncology unit for 4.5 years. She is currently an outpatient infusion nurse in Cherry Hill, NJ. She also has her Bachelor’s degree in English Literature from the University of Scranton, where she played basketball and made many lifelong friends. Originally from Philadelphia, she now resides in Collingswood, NJ. She spends her free time either in Cape May, skiing in the Poconos, or spending time with her family and friends- including her dog Peanut. 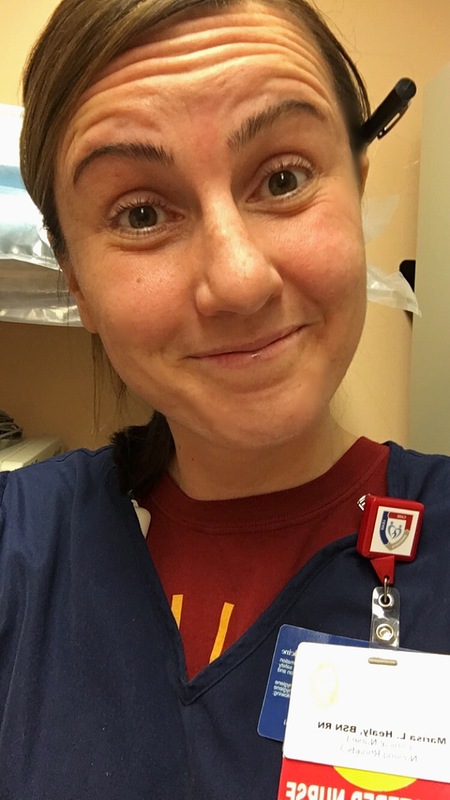 This entry was posted in Homepage, OncoLink News, Scrub Stories and tagged connections, nursing, oncology nursing. Bookmark the permalink.